Power and distribution transformer tanks contain oil for insulation and cooling purpose. There is possibility that the oil may leak or the transformer may explode under abnormal conditions creating fire hazard to surrounding equipment and property. Hence it is customary to provide a oil holding pit below the transformer to catch the leaked/exploded oil and isolate it from other equipment and surrounding area. This oil pit is combined with the foundation of the transformer. We have long experience and qualified senior engineers in designing foundation and oil pit of small and large transformers upto 500MVA, 400KV. 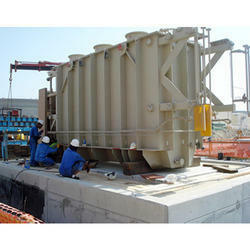 We are able to provide Transformer Foundation service with the vast support of our team.